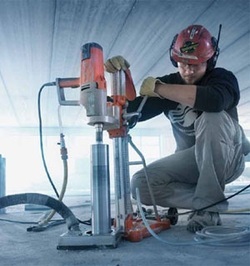 Drill Direct Ltd are experts in the diamond drilling and sawing industry, who take pride in the professional and quality service that we provide to all our clients. This has enabled us to build strong relationships with a host of leading contractors nationwide. In addition to this we have developed a client base in the domestic field, where we have undertaken smaller projects with the same dedication and commitment to quality. We undertake projects of any specification, ensuring high standards of workmanship and safety, whether in commercial, industrial or domestic environments. All employees receive thorough and on-going safety training to ensure constant awareness of Health and Safety issues.